It was a bright sunny day this week as Colorado Auto Dealers Association President Tim Jackson drove me to Phil Long Ford in Littleton to pick up a 2013 C-Max Hybrid SEL, for the first leg of the 2013 Colorado Green Car Convoy. We were about to drive the new C-Max and the CADA Honda Odyssey, wrapped in a Clean the Air Foundation graphic, to Gunnison and Montrose CO, where Jackson was presenting a PowerPoint enhanced talk on the history and future of the auto industry with local Rotary Clubs there. This is how CADA promotes the Denver Auto Show and evangelizes upon the considerable benefits of owning a new car. 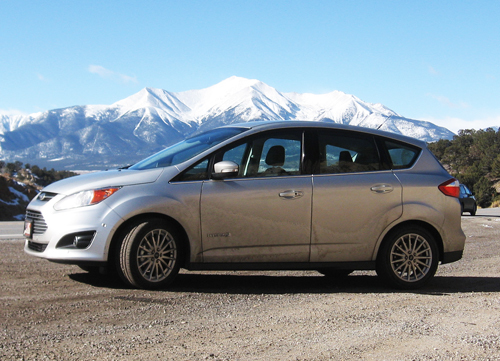 Having driven a multitude of hybrid vehicles over the past several years, the Ford C-Max started to stand out from the rest as soon as highway speeds kicked in and we began to ascend the Colorado Foothills. It’s not that all hybrids make you think limp-wristed acceleration, but some of them drive sensibly even when that’s not your intention. As it turns out, the Ford C-Max is not one of those, as the 2.0-liter Atkinson-style IVCT engine combines with the electric motors to evoke serious power for a commuter car getting an EPA rating of 47-mpg. The truly fun part of driving from Denver to Montrose comes in three separate parts. The first of these begins a few miles south of Fairplay and continues to where Highway 285 intersects Highway 24, near Buena Vista. Here the roadway twists and turns like erratically corrugated cardboard, undulating over ridge and valley with the snow-capped peaks of Mt. Princeton and Mt. Antero as a backdrop. Driving through this area is a joy in any car with the power and handling to glibly navigate the serpentine ups and downs and the C-Max was a sheer delight. Once turning onto highway 50, we had only a few miles to go before beginning to ascend to the 11,317-foot summit of Monarch Pass. Despite melting snow and icepack on this warm winter day, the 2013 Ford C-Max climbed the mountain undaunted, losing its footing for only a split second on one particularly slippery spot. The front wheel drive vehicle with a continuously variable transmission performed as well on the snowy mountain pass as many all-wheel-drive vehicles we’ve driven. One interesting part of the SYNC MyTouch hybrid info display comes whenever you brake to a stop. A message appears stating “96 percent energy returned,” touting the efficiency of the regenerative braking. When you first enter the hybrid, a green leaf crosses the right side of the instrument panel as if blown by the wind coming through the door. When you turn the car off with the start/stop button, a message appears stating, “Thank you for driving a hybrid.” Isn’t that special! Once you pass Gunnison, Highway 50 crosses through the Curecanti National Recreation Area, a long mountain reservoir the highway snakes around. Further along the highway you pass beside the Black Canyon of the Gunnison, now a National Park. The Gunnison River is descending at a terrific rate in this area equal to 34 feet per mile, the fifth steepest mountain descent in North America. Winding through the Gunnison Gorge National Conservation Area, the highway descends along sweeping curves at a similar if not steeper rate of decline. Not all cars like to descend like this, but most hybrids do, soaking up the kinetic energy as they go – driving this portion of Highway 50 in the 2014 Ford C-Max was as much fun as any roller coaster ever made. Not everyone enjoys driving through mountains where sometimes you have a mountain on one side of you and thin air on the other. For some others, the S-curve signs on the side of the road mean Spectacular! Racking up 600 miles in two days by crossing Kenosha, Monarch and Vail passes, plus climbing up Loveland pass to the Eisenhower Tunnel, we averaged 36-mpg in the C-Max without pampering it, generally driving at highway speeds that defeat the car’s aerodynamics. The phone paired easily and the cruise control worked smartly, but we could have used a little more preflight time to acclimate to the newly redesigned articulated steering wheel. The extremely raked windshield creates an open and roomy feel in the front seat and full-size adult passengers in the back seat found nothing to complain about. The 2013 Ford C-Max SEL has a base price of $28,200, to which a technology package was added for $3,080. This provided navigation, Bluetooth connectivity, rearview camera, power liftgate, smart key and even a self parking system we didn’t get a chance to try out. The grand total came to $32,075 with destination charges of $795 included. According to the EPA estimate of 47-mpg, if you drive 15,000 miles in a year paying $3.55 a gallon for gas, your annual fuel expenditure should be $1,150. That’s a savings of $5,850 compared to a 23-mpg vehicle with all else remaining the same. When we divided our actual mileage by the EPA rating and multiplied that by the five-year savings, it still came out to about $4,481. So that means any extra cost the hybrid technology added will be returned within those five years if gas doesn’t go up. If the price of petrol does rise, the return will be much quicker. In conclusion, we have driven more powerful and luxurious hybrids, but they cost more than double what the 2014 Ford C-Max does. It provides good mileage, power and safety, seating for up to five and more cargo capacity than the Prius V at a price point considerably less. Add to that, it’s actually great fun to drive. We think Ford may have hit a homer with the C-Max. So did the sales manager at Phil Long Ford, stating everyone that takes one for a test drive comes back smiling. We were still smiling after driving it more than 600 miles in two days. What an awesome car. Can't wait to get in one. Ford is really stepping up to the plate with realistic and useful alt-fuel vehicles. From week one my prius v has giving me 54 to 56 mpg around city driving. And 47 to 49 mpg I 95 driving. Ford c max is not as big inside or out as my prius v.Ford wishes they could be as good as Toyota.I have owned my prius v for 14 month. Same mpg every week. Ford is going to court for their lieing about mpg. I don't understand the comment in the review which states " seating for up to five and more cargo capacity than the Prius V." All the specs I have read for these two vehicles say the "V" has a greater cargo capacity. The V is longer overall and has a longer wheelbase, which would seem to support the Prius V as the larger hauler. Ok, I need to follow up on my previous comment regarding Prius V being a bigger hauler. I do remember now the C Max has a larger overall interior measurement, total cubic feet/wise. However the Prius V has more cubic feet behind the second row and also more c.ft. with the 2nd row folded down. So it still appears the V has more usable space for cargo. The C-Max is more of a people mover than the V but the V does haul more stuff. The main reason I went with C-Max over the V was it was just a nicer car for less money when comparably equipped.